Grandparents' Day is only recognized by some countries (Australia, Canada, Estonia, France, Germany, Italy, Poland, Italy, Poland, Singapore, Taiwan, United Kingdom and United States). In the USA it is observed in September on the first Sunday after Labour Day. Show your grandmother and grandfather how much you appreciate them by making them a home-made card, a picture frame, bouquet of flowers, or a plaque. This is a very handy gift to any person who likes to knit...so if your Grandmother likes to knit then this would make a great present for her. 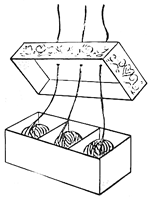 This 3 Compartment Knitting Box it will hold three different balls of wool in such a way that they won't get tangled. Find a rectangle box with a lid. To make the partitions, measure and then cut out, 2 pieces of cardboard so that they will fit tightly inside the box. These partitions will make the compartments in the box. Place the partitions in the box, so that they divide it into 3 equal sections. Stick 4 straight pins, 2 in the front and 2 in the back, through the front and back walls of the box and into the cardboard partitions to hold them in place. Paint the box a solid color and allow it to dry thoroughly. Paint a decoration or design on the box. Paint and decorate the cover of the box the same way. Punch 3 holes through the cover of the box, 1 over the center of each compartment. Place a ball of yarn in each compartment and pull the loose ends through the holes in the cover. Replace the cover on the box. If you like, you may cut, trim, and then glue fancy paper to the box, instead. You can also make the designs or decorations on the box with colored wax crayons. Absolutely Awesome Floral Bouquet for Grandparents Day - - These Color Surge™ flowers are bursting with bright colors! Make a bouquet to dazzle someone special—it will always look fresh! Accordion-Fold Flowers Gift Making Craft for Grandparents - - Surprise someone you love with a bold bouquet of flowers! These are so colorful your green thumb will want to make more! A Family Tree Mobile Activity to Make Gift for Grandma and Grandpa - - A traditional family tree, with its maze of branches and leaves, isnot an easy concept for kids to grasp. This whimsical mobile, which looks wonderful suspended above a child's bed, puts basic lineage into perspective. Your child's portrait is at the top, supporting three generations: you, his grandparents and his great-grandparents. A Garden Plaque Making Instructions for Grandparents Day - - Here is a clever craft idea for summer. Kids can make this garden plaque extra special with all their treasures and display it in the garden to admire - or give it as a very special gift! A Glasses Case - - Here is a simple craft idea that kids can make for parents, teachers, grandparents - perfect for a pair of beside reading spectacles! Art Deco Retro Cards to Make - - In the Roaring Twenties, the cool sophistication of Art Deco was in fashion. Now they’re back! Art Deco designs are famous for their angular fan and diamond shapes and diagonal chevrons. Art Deco buildings home décor, and fashion often rely on mirrors, chrome, and crystal for stark contrast. Breezy Blossoms for Gift for Grandmother & Grandfather - - What’s more colorful than a spring flower garden? Why not get together with Grandpa or a neighbor to create your own breezy blossoms. Bring back that fresh feeling any time of year! Bright Borders Picture Frame to Make - - Make memories with this easy-to-make, no-mess frame. Kids can display their own art or photos of themselves, pets, and family members. Bookmark Gift to Make For Grandma - - Choose a great book for your grandma to present with this crafted bookmark and I'm sure it will melt hearts! Bunch of Daffodils Gift for Grandma - - Aren't these daffodils pretty? You can make your own by following this easy guide! Butterfly Handprint Painting - - Encourage your children to let their imagination run riot with this colorful butterfly handprint painting. Cameo Brooches to Make for Grandmothers - - Here is a really inspirational and unusual gift idea which kids can make - perfect for Mother's Day or a favorite grandmother! You could also make a key ring or perhaps even a small pair of cufflinks so that Dads and grandfathers could be the lucky recipients, too! Card Making for Preschoolers - - Our Card Making for Preschoolers craft can make 'cards with words' easy for Preschoolers who may not be able to write, but they can recognize and pick out letters! These can be made for any occasion or holiday and is a great way to teach children how words are built! Color Change Cards - - E-mail is fun, but there’s nothing quite like a colorful, handmade card that comes with a stamp on it! Many people say snail mail is one of their favorite treats. When do you send friends and families cards? Birthdays, holidays, to say "Thanks!" or "I’m thinking of you!" are all good times to send unique, personalized messages! Cool Cut-Ups Picture Frame - - Looking for a cool way to jazz up a picture frame? Decorate it with bright bits of Crayola Color Explosion Spinner™ art! Cup of Love - - For Grandparents Day, make the nicest "drink" anyone could have. No one can refuse this special cup of love! Cut-Out Coaster - - Here's a homemade gift kids can take a hand in: a stack of drink coasters. Daisy Picture - - Children can sew this pretty daisy picture to give as a gift (mount it and frame in a simple frame like ours) or use it on the front of a card for someone special, perhaps at Mother's Day. Darling Doily - - Handmade fabric doilies are splendid gifts for Valentine's Day, Mother's Day, or birthdays. Children take such pride in their beautiful, useful creations! Decoupage Tray - - This decoupage tray is a super gift which kids can make for Mother's Day, Father's Day, Grandparent's Day or any other special occasion! And how about serving a surprise breakfast in bed on it! Easy Recipe Holder - - This Easy Recipe Holder is a great gift for the women in our lives! It doubles as a functional craft AND a card for that special lady. Great for Mother's day for preschoolers on up! Eggshell Mosaic - - Next time you bake a cake don’t throw away the egg shells - use them to create a lovely eggshell mosaic picture! Perfect as an Easter or spring craft. Faces in Flower Frame - - Need a great gift for family or friends? Show off your new school photos in a hand-decorated frame. Family Album - - This quick informational page will be a permanent reminder of any family reunion. Family Bulletin Board - - This is a simple craft but it makes a cute gift that the kids can make themselves - perhaps for Grandparent's Day? And it is a super "Back to School" craft too, providing a special place for children to show off their best work. Family Food Favorites - - Combine three important family activities - dinner time, reading, and craft time - to create a fun diorama of your family’s favorite foods and traditions. Family Game Memories - - This is a great way for generations to get to know each other, and learn some new, or traditional, games. Family Tree - - This Family Tree is a great Grandparents Day Craft for Toddlers on up. They can make the tree and you can write on your family names. Make it even more special by gluing on family pictures! Family Tree - - This family tree display makes a great project (and poster) at any time of year, but also an unusual and special gift for Grandparent's Day. Fishing Handprint - - This Fishing Handprint craft is a really fun fish craft for Preschoolers or Toddlers to make! This would also make a great Father's Day, Grandparents Day, or Sunday School craft! Decorate your fish any way you choose, and write a message in the top right corner, for example: "Happy Father's Day", "Teach a man to fish" or "Gone Fishing"
Flower Photo Frame And Card - - Perfect for Grandparent's Day or Mother's Day, you can make just one flower photo frame or fill up a vase or bouquet! Foam Roses - - Who doesn’t like getting red roses for Valentine’s Day? Make this fun craft for your Mom and she will love and cherish it. Foot Print Magnets - - These adorable Foot Print Magnets are a perfect gift for a Grandparent or for someone special. These would even be fun to do with your baby, change the words to suit the occasion! Gift for a Golfer’s Desk - - Need a gift for someone who loves golf? Receiving this picture frame and pencil holder will be as satisfying as scoring a few birdies and eagles! Golden Vase - - Show your grandparents how you much you value them this Grandparents Day and create a golden vase to complement their home. These vases are attractive even without flowers! Grandparent Award - - The Grandparent Award is a great craft idea for toddlers (on up), you may need to cut the 'ribbons' and write on it, but they can stick on any decorations they'd like on their special homemade gift! Grandparent's Day Muffin Flower Card - - These are simple and fun crafts for even the youngest children to do. Greetings 4 You - - Enjoy making your own cards for holidays and birthdays? Crayola Color Surge™ Marker and Paper System make your cards pop. Crayola Hassle Free Watercolor mini-paintings make them keepsakes. Groovy Grandma Apron - - Being a member of a family is wonderful. Because your grandparents have lived a lot longer than you, they have many things to share: stories about what life was like when they were your age, or skills and talents you can learn from them such as cooking or fishing. Hand-Colored Oven Mitts - - Tap kid's creativity to turn plain oven mitts and pot holders into handy kitchen art fit for gift-giving. Handprint Bouquet - - This Handprint Bouquet craft is a unique and personalized craft to give or keep. Write your own message to the special someone who will receive this great work of art! Handprint Heart - - If your child prints a handprint heart, it will be yours forever! These make a super quick craft activity for Valentine's Day or Mother's Day and a lovely keepsake, too. Handprint Magnets - - Here is a fun way for children to display artwork on the fridge - and it makes a nice little present for Mother's Day, Father's Day or Grandparent's Day too. Handprint Wall Hanging - - Instead of just making something for your grandparents, get them involved in the project too! Join your handprint with your Grandma or Grandpa to make these adorable keepsake wall hangings. Handy Tray - - Honor those "grand" people in your kids' lives on National Grandparents' Day (September 9) with this functional keepsake. Hanging Scented Potpourri Ball - - This is an easy project and a good choice for older children who wish to make something a little different for Mother's Day. The doily and silk flowers make this potpourri ball pretty to look at, while the fragrant potpourri gently scents the air. Heart Fridge Magnet - Here's a handmade kids craft which anyone would be proud to display on their fridge - perfect for Valentine's Day or Mother's Day. Heart Plant Stick - - This super idea is perfect for children to make for their mothers on Valentine's Day or Mother's Day. The craft can obviously be adapted to suit the ages of your children and the materials you have to hand. Hundreds of Hearts Wreath - - Multiply your love on Valentine's Day or any time! Create a wreath of painted hearts for someone you adore. I Love My Mum Flower - - This Mother's Day craft encourages children to think about what makes their mother special. It is sure to become a treasured possession! I'm A Little Teapot Craft - - This is a good craft for a grandparent who enjoys a cup of tea! You can accompany it with some purchased tea bags, tea pot or tea cup. Attach a single bag of tea and this poem for grandparent's who live in a different city. I’m Growing Up Handprints - - Make your own handprint paper or "I'm Growing Up" keepsake! Crayola® Color Wonder™ won't color on skin, walls, carpet, or clothing. Keys & Coin Keeper - - Some Dads - or brothers or grandfathers - jingle lots keys and coins in their pockets. Give them a hand for their pocket change and car keys with this one-of-a-kind tray! Kids' Art Window Charms - - Even the snowiest of winter days looks cheerier with these brightly colored charms hanging in the window. Your child can draw geometric designs, her cat, herself -- whatever strikes her fancy. They make great kids' room decorations and lovely homemade gifts for moms and grandparents. Lace-Edged Fan - - Why do people use fans? Not long ago, every well-dressed woman carried a fan. Today, fans are for fun-and to keep cool. You can make fans for yourself, or to give as gifts. Lacy gift Wrap p - - Wrap your gifts in recycled paper decorated with a lacy look using Crayola® Gel Markers. Lacy Ring Binder - - Transform an old or inexpensive ring binder to make a very special gift. Or maybe as a place for your daughter to keep her best work and other precious memories. Layers of Love Model Magic Heart - - Pile on the Model Magic® and watch kids' love for art grow. With layers of love, good times and good feelings are always close at hand. Mini Chest of Drawers - - Here is a chance to turn all those un-recyclable fruit juice cartons into an attractive and useful gift. This chest of drawers can be an excellent desk tidy, or very useful in the workroom as storage for screws and nails. This is a craft that involves a bit of adult preparation but when this is done even the youngest child can achieve an impressive result. Name Magnets - - Kids love to see their own name, and with this craft they can make some really effective magnets to display their own artwork on the fridge - or to give as a gift to siblings or for Mother's Day, Father's Day or Grandparent's Day. Origami Tulip - - These pretty tulips are perfect for Mother's Day cards, Spring decorations, or just to cheer you up! The flower is relatively easy but the stem is stiff to fold and may not be suitable for younger children. Paper Mache Bowl - - This Paper Mache Bowl is a great gift to give someone special! It will have to dry overnight for two nights, but its well worth the wait! Paper Maché Lion Book Holder - - This is a very cute little gift for siblings to make for each other or for a favorite grandparent. Paper Maché Tiger Book Ends - - Make two identical tigers or two different animals for these cute bookends. Makes a great gift from the kids. Party Place Cards - - Grandparents are often the best teachers about giving and receiving. Many grandparents love to give presents or special adventures and opportunities. Why not show them that you also like giving as much as receiving? Patchwork Ring Binder - - Give your children some scrap fabrics from your stash and let them decorate an old or inexpensive ring binder to make a super gift - or a special file in which to keep their certificates, awards etc. Paint-Swirl Hearts - - While Grandparents may be old hands at this love business, they're never jaded when it comes to finger-painted cards created by their school-age sweethearts. Peek-a-boo Treats - - Recipients of this valentine need only look into their hearts to find something truly sweet. Peek-a-boo Valentine - - Here's what we know: more than 90 percent of kids want a valentine for their grandparents. Here's what we suspect: more than 90 percent of grandparents love nothing more than their grandchildren's faces. Merge that data and you get this valentine, a wide-eyed favorite for all ages. Personalized Flowerpot - - Kids can give Mom a bouquet and a card in one with one of these hand painted planters. Personalized Magnets - - Display your family's magnetic personalities on your own fridge, or make a gift set for friends and relatives. Photo Frames from CD Boxes - - Grandparents, aunties and uncles and godparents always love to get photos of their favorite children. Nice frames can be expensive to buy and impersonal too. Why not get your children to help you create some frames with bits and pieces you have lying around your house? You will all have great fun doing it and will produce fun little frames that will be especially treasured because the kids had a hand in making them. Be warned – this idea is addictive! Plaster Handprint Picture - - This Plaster Handprint Picture captures your child's hand forever and makes a unique gift for Father's Day, Mother's Day, Grandparent's Day or any special occasions. Picture Puzzle - - This Picture Puzzle is a unique, personalized gift idea that anyone would love to receive, and it's a super fun kids craft to make as well! Pretty Summer Flowers - - Bring a colorful bit of summer inside anytime with this miniature planter. This project will grow on you! It makes a great gift, too. Rudolph the Red-Nosed Handprint - - Your child gets to lend a hand in crafting this ultra-easy decoration, which makes a sweet gift for grandparents this Christmas. Sea-Glass Planter - - Cover a metal planter with Model Magic® Fusion™ compound. Press in colorful sea glass or other natural materials. And presto - you have created a beautiful indoor gift in which to grow herbs, flowers, or tropical plants! Shell Photo Frame - - Take advantage of a trip to the beach to collect shells for this pretty shell photo frame - it makes a sweet gift which the kids can make themselves, too. Silhouettes - - These are a really super keepsake gift kids can make for Mother's Day, Father's Day, Grandparent's Day - or any time, just for fun! Special Words Pencil Holder - - Tell someone how great they are by making them this Special Words Pencil Holder. It's made from 100% recycled materials that you a have around the house! A great homemade gift for Mother's Day, Father's Day or for someone special! Spin Art Heart - - Nothing makes the head spin like love -- except, perhaps, this artistic valentine. Star Photo Frame And Card - - Perfect for Grandparent's Day or Father's Day, you can make just one star photo frame or a whole galaxy! Stay-in-Touch Portrait - - How do you stay in touch with friends and family? E-mail? Letters? Phone? Display colorful portraits of people you love who live far away near your computer or desk. Sun Handprint Craft - - Bring a little sunshine into your home with this super easy sun handprint craft for summer! And as it involves some painting, some tracing, some cutting and some sticking, it proves a particularly popular craft for kids! The Perfect Tie - - Children can make The Perfect Tie for that special man in their life. Daddies, Grandpas, and Uncles will be proud to wear this tie made especially for them! A great homemade gift for Father's Day, Grandparent's Day, or any special occasion. Tissue Paper Carnation Bouquet - - Flowers are a mainstay on Valentine's Day, but real flower fade and wilt. Make this pretty in pink bundle of carnations from tissue paper, they will last forever! Tissue Paper Flowers and Juice Jar Vase - - You can make some flowers and put them in a store bought vase or you can make the vase and put in some silk flowers. Treasure This - - This clever treasure box, which is organized around the principle that anything goes, has ample room for plastic bags of beach sand, seed packets, subway tokens, maps, sea glass, photos, finger paintings, invitations or even a tiny book of best friends' autographs. Versatile Vase - - Handmade gifts are a delight to make and receive! Kids arrange dry or silk flowers, feathers, or other lovely items in their Very Versatile Vase. Vintage Valentine - - Borrow a Victorian tradition and treat your modern grandparents (or other doting souls) to photos of their favorite kids. 'Visit Me' Guest Soaps - - This Grandparents Day, make grandma and grandpa's visit sweet and bubbly with these pretty "visit me" guest soaps! Votive Candle Holder Craft - - Craft a holiday gem with this jeweled votive candleholder. Kids love bejewelling the baby food jar to make this treasured craft. Watch Me Grow Handprints - - With a little personal touch, you can capture your children's handprints in Crayola® Model Magic®. This keepsake wins hands down with parents, kids, and relatives! Wallpaper Butterfly Note Holders - - Add a clothespin and a magnet to these wallpaper butterflies and you have lovely note holders or picture holders for Mom to put on the fridge. Wired Star - - Although cookie cutters are best known for their work in the kitchen, these fun-shaped baking utensils can also play a role in decorating your family's Christmas tree. Wooden Keepsake Plaque - - A wonderful gift for Grandma! You Are My Sunshine Craft - - A photograph or hand drawn picture of your grandparent's face(s) and a photograph or hand drawn picture of the child's face that will fit inside the circle of the flower and the circle of the sun.